I love this Vietnamese style tofu dish. 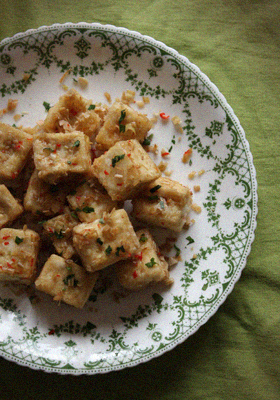 The crispy cubes of tofu are simply seasoned by lemongrass, a pinch of chilli and salt. Very simple dish but it has a beautiful flavor and aroma. Cut the tofu into 1 inch cubes and pat dry with kitchen papers and lightly coat them with the corn flour. Heat the oil to 340F/170C and deep fry the tofu until light golden, place them on kitchen paper to remove excess oil. Heat the 1 tablespoon of vegetable oil in a large frying-pan, add the lemon grass and chilli, stir-fry for 2 minutes over medium heat. Add the deep-fried tofu and season with the salt, stir-fry everything together for 2 minutes. Turn off the heat, sprinkle with the chopped coriander leaves. 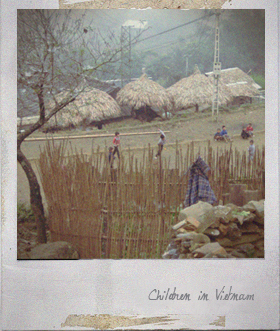 You are currently reading Spicy Lemongrass Tofu at Fish Trip Cafe.